This post has been sponsored by Hurst Beans, but the content is completely my own. It’s chilly outside and you’re looking forward to a cozy evening inside with your family. Maybe you are planning a family game night or just want to relax and snuggle up together watching a favorite movie. Dinner is the last thing on your mind, but you know all these mouths of yours are going to want to be fed. 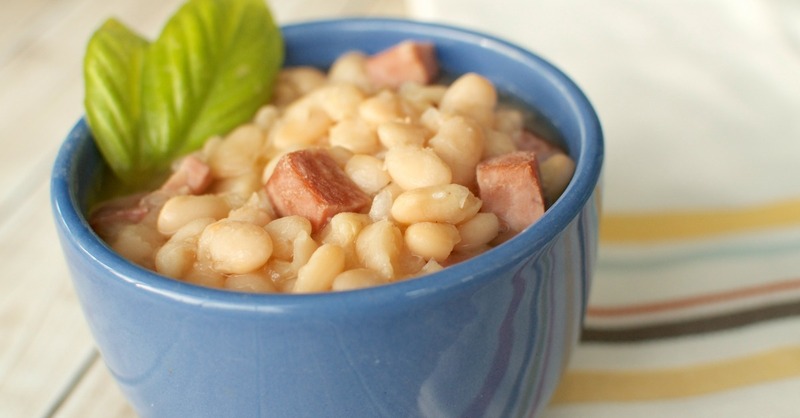 Why not pull together a big pot of Great Northern Beans and Ham Soup. There’s nothing better when the weather is cold and this recipe only requires three ingredients. You can also easily make it ahead of time and even freeze the left overs for another night. Soup is the ultimate easy and healthy meal. Bean soup has always been one of my favorites. My Grandmother used to make big batches of soup at the holidays using leftover ham or turkey and I almost enjoyed it more than the big celebration meal. All the grandkids would curl up with a big bowl of the piping hot soup in the living room and watch classic holiday specials. I have so many good memories of those times spent together. 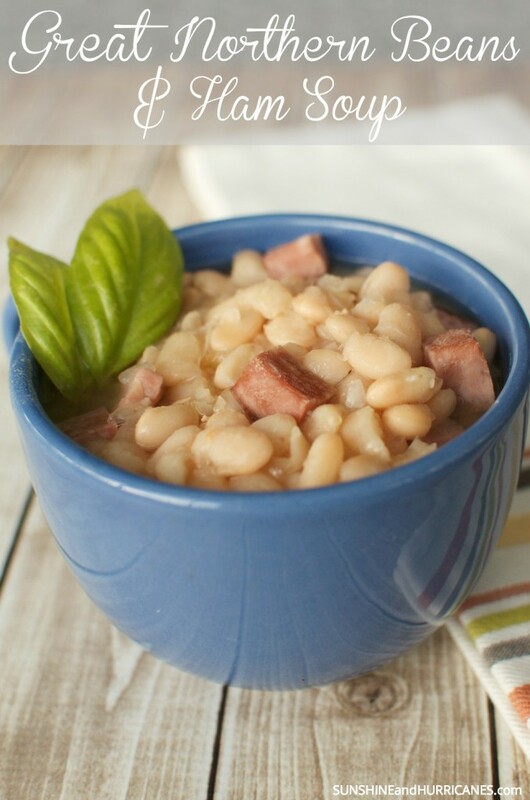 I’m sure that’s why to this day I still love to make soups of all kinds and why I really love this Great Northern Beans and Ham Soup recipe from Hurst Beans. It’s so easy to make and just perfect for leftover holiday ham (or turkey if that is what your family likes this time of year). What I love most (and I think you will too) is that it only requires three ingredients. Rinse the beans and discard any unwanted debris, then soak the beans in a large pot covered with 8 cups of water overnight (or at least six hours). Drain the beans and then add them back to the pot along with the onions and the ham. Add eight cups of water and bring to boil. Turn down the heat to low, cover and let simmer for about an hour and half. A few minutes before you are ready to serve add the flavor packet from the Hurst Great Northern Beans along with salt and pepper to taste. Serve with some warm crusty bread and you’ve got a delicious meal that the whole family will love. Also, if you have leftovers, they freeze beautifully for a quick meal another busy evening or you can use them to send in kids lunches later in the week. Rinse the beans and discard any unwanted debris. Soak the beans in a large pot covered with 8 cups of water overnight (or at least six hours). Drain the beans and then add them back to the pot. Cover with eight cups of water and bring to boil. Turn down the heat to low, cover and let simmer for about an hour and half. A few minutes before you are ready to serve add the flavor packet from the Hurst Great Northern Beans. If you’d like some other other recipe ideas for Great Northern Beans you can visit the Hurst Beans website HERE. 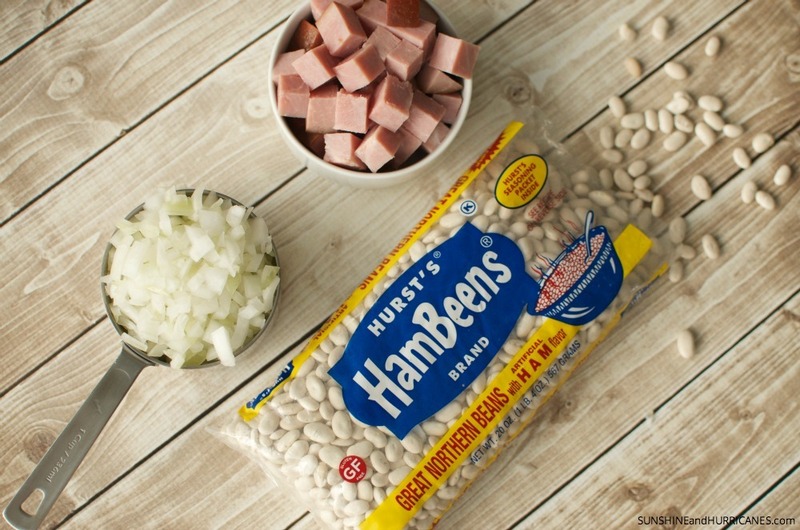 I fix these ham and beans in Florida all the time for cool or chilly evenings! This sounds really good. What would be the timing if you wanted to make it in a crock pot? And, would I have to soak the beans before I make the soup if I do it in the crock pot? Hey there! I would take a look on their website. http://www.hurstbeans.com/. Some of their beans are specifically meant for the crockpot, but these were traditional. So, if you wanted to try them in the crock pot you might have to soak them or you could just cook on low for longer like overnight, which is what I do with most of their crock pot recipes. Hope that helps! I will be adding this to my newly healthy lifestyle. Ooooo this soup looks so tasty!!!! I will have to give this a pin so I can give it a try! Yum! This sounds delicious! I love ham in soup, so comforting and filling in the winter time. Wow, this is such an easy recipe! I’ve never tried a bean soup but I really love the flavors you combined in this recipe! This looks so good! A great way to use up all the left over ham from our Christmas dinner! This looks yummy! I love soups in the winter time and I love the creaminess of white beans. This recipe sounds like a winner for me! Thanks! Weird timing! I just tried great northern beans for the first time a few weeks ago and loved them! Thanks for the recipe inspiration! They are delicious! Keep on enjoying them this Winter! 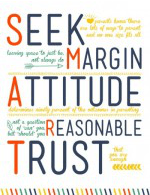 Yes, it’s perfect for the cold months! I’ve never tried a soup like this before but with the cold months upon us, I’m always on the hunt for soups to keep warm! You’ll love this one, hearty and filling!!! !